Welcome to the four hundred and eighty-ninth of my blog interviews with novelists, poets, short story authors, biographers, agents, publishers and more. Today’s is with non-fiction and fiction author David Kalu aka N K David. A list of interviewees (blogged and scheduled) can be found here. If you like what you read, please do go and investigate further. Morgen: Hello, David. Please tell us something about yourself, where you’re based, and how you came to be a writer. David: Thanks Morgen, I am a writer and an Author. I am currently based in Nigeria. I picked interest in writing because while I was in college, I was forced to improve on my creative ability to enable me do well in essay writing and once I got the skill I became the best in it. That was when I wrote my first work “The noble killers” which I hope to publish in future. I think the reason I write much is because I do not really talk much so I say must things in my writing and I have message to pass across to humanity. Morgen: That sounds like a great reason to me. I’m pretty quiet in real life too (unless you get me on the topic of writing). You write non-fiction, how do you decide what to write about? David: I look at things that happen around us especially what we can easily see and know to be fact. That is mostly what I write about. Morgen: They do say to write what you know. What have you had published to-date? David: I have published two books. My first book is “It is time we truly know Why Jesus wept: at the grave of Lazarus” published by Authorhouse UK Ltd, and latest book is “Most perfect exchange: the cost of liberty” published by booktango. David: I contacted some publishers and I did not want the idea in my first book to be changed so I decided to self-publish. Morgen: There is more control in that. Are your books available as eBooks? Do you read eBooks or is it paper all the way? David: My first book is available as eBook and in paper back/ hard cover while my secondly book is currently available as eBook only. David: As a self-published Author, I made most of the decisions. I chose the title and I approved the cover designs. The cover may not be so important to me but the titles are very important to me. David: I am currently working on other books the title of one of the books is “The formula for reincarnation.” It is passing through some processes now. It is mystical and I hope to publish it soon. Morgen: If you let me know when it’s out I’ll add it as a footnote to this interview. Do you manage to write every day? Do you ever suffer from writer’s block? David: I write everyday but funnily enough I do not write books or articles everyday because I am also in the academic field so I it can be for my study. Morgen: It’s all good practice though. Do you do a lot of editing or do you find that as time goes on your writing is more fully-formed? David: Well, I normally imagine my story before I start so I know what I want to achieve at the end but the task is how to create the events that happens in between the story line but I realize that as I create the characters the story fills. I do not really do my editing of the story because I think and create it before I pen it down so only in rare cases do I have to make changes. Morgen: I do think that’s easier with non-fiction but then the only non-fiction I write is about writing. Do you have to do much research? David: It depends on the story. I do little research but I usually start with what I know. Morgen: That’s a good plan. Do you have pieces of work that you think will never see light of day? David: None for now, although I have some works that have not been published but I hope to publish them some day. Morgen: It’s so easy now with eBooks to go your own way so hopefully they all will be. Have you had any rejections? If so, how do you deal with them? David: Well, I won’t really call it rejection. When I wanted to publish my first book, a publish said my work is good but they do not want to publish religious books because it was a bad market to them so they asked for thriller among others which they believe they could sell. Morgen: I’ve had agents tell me they want more crime and historical but I’ve learned from these interviews how popular religious subjects are – for you it was the right thing but just for the wrong person. How much of the marketing do you do for your published works or indeed for yourself as a ‘brand’? David: I have not done any marketing for my books. However, I was interviewed by Indies in Motion in connection with Global voice broadcasting Radio, on 9th April 2012. That was my first public awareness although I personally tell people about my books and works online. Morgen: Online potentially captures a huge market so it’s important, I think, to be active online. What’s your favourite / least favourite aspect of your writing life? Has anything surprised you? David: My favourite is currently my second book, “Most perfect exchange…”. My least favourite was some mistakes I made while I published my First book because I rushed the publication but that is corrected in eBook format now. No surprises yet. Morgen: That’s the great thing about eBooks; I had a spelling mistake pointed out to me and it took seconds to change it. What advice would you give aspiring writers? David: Be yourself and tell or write your story as you want it to be. David: Many of them to choose from but since I am restricted, I shall invite Leonardo De Vinci (what some friends call me), Abraham Lincoln, and George Washington. I shall prepare and serve fruit salad, fish soup, with Irish potatoes and red wine. Morgen: Great choices. Is there a word, phrase or quote you like? David: “The sweetest victory is that won when everyone had counted you out because they thought you could never make it.” N. K. David and “Nobody can stop you but you.” N. K. David. Morgen: Writers do need perseverance and passion. They say a successful writer is one who didn’t give up. Do you write fiction? If so, do you have a favourite of your books or characters? If any of your books were made into films, who would you have as the leading actor/s? David: Yes. Yes, “Most perfect exchange…” (Laughing… its not going to be easy to make the choice for movie directors) Denzel Washington as Michael, and Angelina Jolie as Lydia then the Alicia Keys as Regina, they can fix the others. Morgen: I’m sure if you had those three they’d have no problem getting other actors on board. Do you plot your stories or do you just get an idea and run with it? David: I get the idea, imagine, and plot the story. David: I do not create names, I use common names. I am yet to write a story where I use imaginable names. Morgen: The thing about common names is that we can instantly tell (usually) whether the person is male or female and we often get a picture of them, i.e. an 80-year old is unlikely to be called Britney. What point of view do you find most to your liking: first person or third person? Have you ever tried second person? David: I like first person most but I write third person. I have not tried second person. Morgen: It’s a fun point of view (I love it, anyway) but very limiting, especially in non-fiction (self-help perhaps). Are you involved in anything else writing-related other than actual writing or marketing of your writing? David: I write on various topics like religion, relationship, education, human right, amongst others online, I have a blog. David: I focus on my studies or engage in sports. David: I am on many social networks like facebook, twitter, linkedin, wordpress among others and I believe it is valuable because that is where I met people and I get to know what is happening in the publishing field and get help on promotions among others. Morgen: I’m on the same and, this sounds dramatic, but my writing life would feel really empty without all the interaction I have with other writers and readers (although I wouldn’t know that if the internet hadn’t been invented). Having grown up with an older brother, I’ve always loved technology but being a writer in this day and age is just fantastic. What do you think the future holds for a writer? David: Well, it depends on the writer and what the writer wants to achieve. For me, I write to send message to the world and I trust we shall understand the message someday, that is my aim. In all, the future is good for writers. Morgen: I agree. I do feel we have more of a say than we used to. Where can we find out about you and your writing? David: Well, http://www.facebook.com/david.kalu77 and my works are available on http://www.hubpages.com/profile/davidkaluge. David: I just want to say thanks for your time. David: How did you get the idea of what you are doing and how does it help you and your blog? Morgen: 🙂 I was invited to do a blog interview and was hooked. I’d already been doing fortnightly audio interviews for my podcast but this was so much easier that I’m able to post one a day. 🙂 Whilst it’s rather taken over so I don’t get too much writing done (I make sure I write a story a day for my 5pm fiction slot) it’s a privilege speaking to so many other authors. Thank you, David. Oh! I see her everywhere. She is the only reason why I believe in mysteries although no mystery can explain how she appears everywhere. I never saw her left because she has never walked out of my presence. She is always with me and she is her even as I pen down my humbly words for her to read. I do not know how she does it but I see her everywhere. Yes, she is everywhere. She is not an illusion and there is no omission of her presence in all that I see. I cannot explain if it is a spell or a magic and I do not seek for an explanation of how she does it because my pains and sorrow are lost in her presence. Even as I walk alone in the lonely street of love yet I am never alone. She loves me just as I am. She loves me because I choose to be me and no one else. Money can’t buy her love that is why she loves me without looking for riches and glory even though men came with their riches to take her love away from me. I was empty but she made me whole with her true love. Her presence gives me pleasure, a pleasure which I treasure and it can be measured. She stole my heart, my soul, my mind, my spirit, and my body and I have nothing left yet I am whole because she carefully and wonderfully possessed all my being as if she is my maker. Can she be my maker? She took all that I have and I wish I have more to give to her. Many kings pray for a queen like her yet I am not a king but I know she is a queen that has made me understand the happiness of kings that have no sorrow attached to their crown. She raptures me to her world and her world is where I belong. She is the only creature, the only thing I see, feel, and think. Yes I am gladly obsessed and possessed by her and that is why she is everywhere. Even though she is here with me as I pen down my words for her yet I know she is out there somewhere waiting for us to see and meet each other, maybe, for the first time and live in our world of love, a world which we shall create like no other world. I shall wait for you because I know someday we shall meet to part no more. In mankind’s quest for happiness, a lot of concepts have been devised and pursued- power and influence have been sought, acquired and abused, wealth has been amassed and abused as well, just name them. Astonishingly, happiness, which is the pinnacle of these endeavours, has remained elusive. However, the solution to this seemingly intractable problem is unimaginably the simplest thing anyone can do as is presented by N. K. David in this thought-provoking, great concept and irresistible novel, which doubles as an indispensable guide and a clarion call for all (skin colour notwithstanding) to endeavour to acquire the hitherto elusive happiness and its attendant peace, by deleting from our minds, records and altitude all factors of hate and racism, and replace them with genuine love and understanding. “Just imagine a world full of love….” In fact, if you miss this book, you miss the very essence of existence, and happiness shall ever elude you.” E. U. Lawrence. N. K. David is the Author of the book ‘It is time we truly know why Jesus wept,’ published by Author house, ISBN NO .9781438923260 or 9781438923277, paperback and hardcover. The E-book format is available for down on booktango. The book is available online stores worldwide. It’s a must read for humanity because it is truly time. 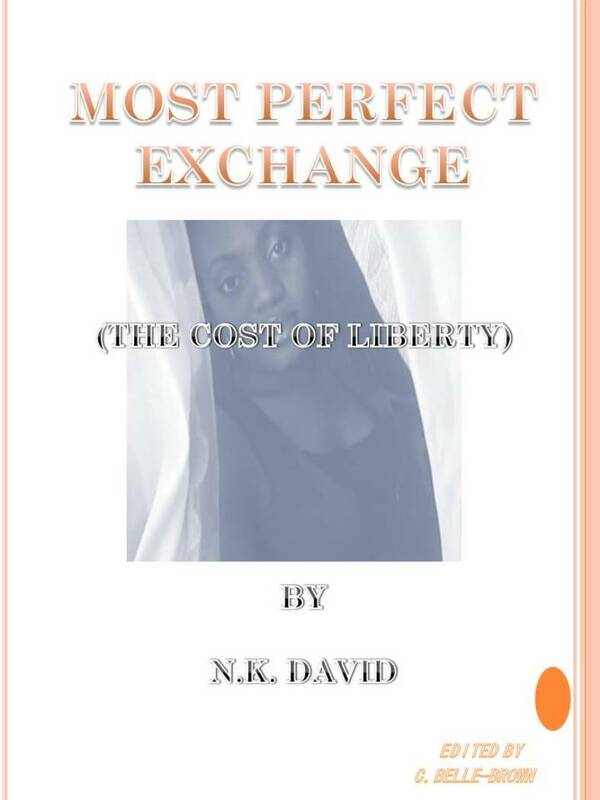 He also authored the book, “Most perfect exchange (The cost of liberty)” it is currently available in E-book format on many E-book stores or booktango. It is a book that has made many people wonder if it will ever be forgotten in human history because you are involved in the book. The author saw need for freedom and religious tolerance, equity, justice for all. Its shame that humanity will be divided by their religion just as humanity was once divided by the color of their skin. Morgen, thanks for that enviable interview with to David Kalu. Kalu, Bravo. Thanks Julius for your comment. Morgen did a great work here here.